Writing your own songs on the guitar is probably one of the most satisfying aspects of being a musician, because you're creating something new and beautiful. It is something that hopefully, people will like and want to listen to. Writing songs is something I have done since I was a teenager and since my main instrument just so happens to be the guitar, it's the one I use for creating the musical part. I also write the words and create a melody for singing. Remember, a song is not actually a song if it's just a collection of chords or riffs in some kind of sequence. But it becomes a song when those chord or riff sequences form a melodic pattern that combine with a sing-able or playable melody (as in the case of an instrumental song). There is a definite creative process going on when I slip into that writing zone and its something that happens when it happens. Often it will happen when I'm out walking or doing things where I can't get to my guitar or a recording device to get the idea down on. In those cases, the great idea is usually lost! But when I'm sitting down practising on the guitar, it sometimes happens that I get an idea for a chord or riff sequence that sounds pretty cool and with some trial and error I can come up with something that I like the sound of. If a melody starts to coalesce inside my head at the same time, even better because I can start to hum it as I play and that is what gives the jumble of notes a pattern that will form itself into a usable song or a part of a song. 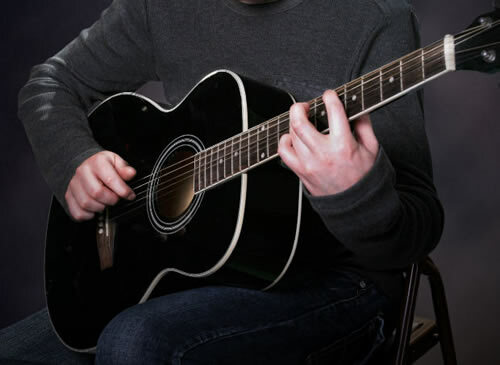 Which Guitar Chords Go Together Best? There is no set rule that says this or that chord must follow another, although my ear generally tells me when something is right or just plain wrong. I've listened to a lot of music in my life from many different styles from heavy metal to classical and most of it will adhere to a sort of unspoken rule that certain chords just sound nice when accompanied by certain others. It depends on which key you want to write the song in, but a good example is the popular twelve bar blues sequence that can start in A, followed by D, back to A, back to D and to E on the turnaround and either down to D and back to A, or straight back to A. You can transpose those chords up or down to create a different sound and depending on what key your singer prefers to sing in it can give you some nice variation in songs that follow the same pattern. Several popular Pink Floyd songs were written in B minor (think "Shine On You Crazy Diamond" or "Comfortably Numb") and their key sequences gave those songs a mood that was all their own which you'd recognize a mile off. You can and should work with the relative minor (or cousin chord) for lead work over certain chord structures to give a powerful feel to songs. Using the relative minor also works for singers finding a melody over interesting chord sequences. To find the relative minor of any chord, just look for the sixth note in the major scale. For example, F-sharp minor would be the relative minor for the A-major chord, G-sharp minor for B-major etc. Playing or singing in this way makes for an interesting melody. It just means you play or sing the notes of the minor chord over its underlying major chord. These days with digital recording studios pumping out perfect songs, perfectly recorded by note perfect sequencers, ahem I mean musicians (yeah, right), lots of inexperienced guitarists suffer from lack of confidence if their performance is not an absolutely note perfect rendition of the original piece they are playing. This is not what live music is all about. Humans make mistakes, it is in our nature! Guitarists make them too, even the very best of the best. It's what makes a live performance so much more interesting to watch and listen to than a perfectly contrived studio recording of a song. It's the mistakes that sneak into those lead breaks that transforms the contrived into the exciting! It's how mediocre melodies become captivating! It's how average songs become classic hits! Do not be afraid to make a mistake when you're playing and also don't be too worried if you inadvertently hit an open string that you're not supposed to be hitting when going for that clean chromatic run! These little things give colour to music that is rubbed out by the recording producer looking for something that they really should not be looking for, ie absolute perfection. I say, let your creative forces control what you play and to hell with the odd mis-hit or unintended harmonic or, heaven help us, feedback! Where would guitar playing be if Jimi Hendrix hadn't got his Strat to feed back when the darn guitar was built to NOT feed back! So be exciting when you play and it will be reflected in your writing ability. Truly amazing songs are still waiting to be written by the person who is unafraid to break out from the limiting and restrictive "have to be perfect" mould that record producers seem to be chaining musicians up with these days. Get real, down and dirty and play your guitar your way. And you could find yourself humming the tune to the next great classic!